The New Year's Mouse is an Event Mouse found during the annual Great Winter Hunt and Lunar New Year events. or Lunar New Year location Charm: ?? Information on how to locate and capture the New Year's Mouse can be found on the current Great Winter Hunt or Lunar New Year location page. Attraction: This mouse does not consume cheese or charms and is caught as a Bonus Hunt when winning New Year's Courses. Loot: King's Reserve Bubbleh, Satchel of Gold (2,011 gold). 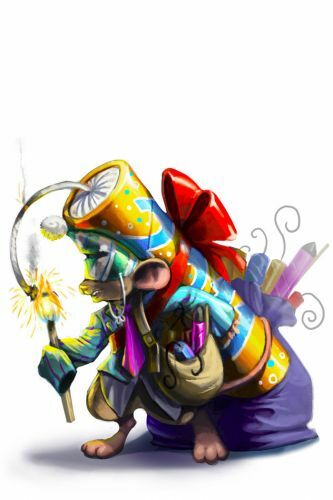 30 December 2009: The New Year's Mouse was released for the first time in Ronza's Traveling Shoppe during The Great Winter Hunt '09 event. Due to a typographical error, the New Year's Mouse was originally released as the "New Year's Mouse Mouse". The release of MouseHunt Version 3.0 changed it again to "New Years Mouse", but by 2013, the missing apostrophe was restored. 30 December 2010: The New Year's Mouse was released with the image updated to have the firecracker labelled "2011". 30 December 2011: The New Year's Mouse was released in the Festive Comet and across the kingdom during the Great Winter Hunt 2011, but the image remained unchanged with the firecracker still stating 2011. Outside of the Festive Comet location, it dropped regional gifts, such as the Gnawnia Winter Gift, as loot. 23 January 2012: The New Year's Mouse was released as part of the Year of the Dragon Festival and its image was updated with the year no longer showing on the firecracker. During the Extreme Toboggan Challenge, the New Year's Mouse was caught as a Bonus Hunt and did not consume cheese or charms. This page was last edited on 30 December 2017, at 20:15.